Spicy pork kebabs rest atop an easy and delicious cauliflower rice with roasted tomatoes and onions in this Pork Kebabs with Cauliflower Rice. My favorite way to cook boneless country style ribs. Post may contain affiliate links, full discloser on side bar. Whenever I see boneless country style ribs on sale, I don’t hesitate to buy them. I love them! They are so versatile. They could easily be used in Shredded Pork Tacos with Pepita Slaw, Lemongrass Pork Skewers, or Grilled Tahini Pork Skewers. But I think my favorite way is these broiled pork kebabs! I didn’t feel like going out to the grill and I had already heated up my oven to roast the cauliflower rice, so using the broiler seemed like a no brainer. The boneless country style ribs were easy to cut into the perfect size cubes. With a broiler set to high and the kebabs about 6 inches from the heat, they were done in just 10 minutes. Just remember to turn them once at the 5 minute mark! Cauliflower Rice Roasted in the Oven! Oh my gosh! Roasting the cauliflower “rice” is the best idea ever!! Instead of huge mass of the rice in your skillet, it spreads nice and evenly on a baking sheet! This is my new most favorite way ever to eat cauliflower. Then it was just a matter of making room for the onions and tomatoes. I lined the baking sheet with the veggies with parchment paper and the baking sheet for the pork kebabs with aluminum foil, so there were practically no dishes! As someone who began doing dishes at age 8, with no siblings to take turns with, I loathe doing the dishes and anything that makes fewer dishes immediately goes to the top of my list! So, easy..check, hardly any dishes…check, delicious…check!! Looking for some other ways to use up cauliflower? How about Thyme-Rubbed Salmon with Cauliflower Risotto or Baked Cauliflower Risotto. This was inspired by a Donna Hay recipe that used lamb kebabs. Your going to love the spicy Pork Kebabs over the low carb cauliflower rice! Place cauliflower in a food processor and process until it looks like small grains. Line a baking sheet with parchment paper. Place cauliflower, onions, and tomatoes on the baking sheet and drizzle with the oil and season with salt and pepper. Toss to combine and spread out. Roast for 20 - 25 minutes. Meanwhile, in a small bowl, combine the cumin, all-spice and salt and pepper. Add the pork and toss to coat. Thread onto 4 skewers and brush with a little olive oil. Line a baking sheet with aluminum foil and place the skewers on it. Remove the veggies from the oven and turn it to broil. Broil the kebabs about 10 minutes, turning once at 5 minutes. Drizzle the lemon juice over the cauliflower mixture and divide it between 4 plates. Top each plate with a skewer and garnish with fresh parsley and mint. That hit of lemon juice at the end is completely delicious! Love that added hit of flavour. Such a fantastic pairing! Loving the cauliflower rice here – hooray for CSA season! 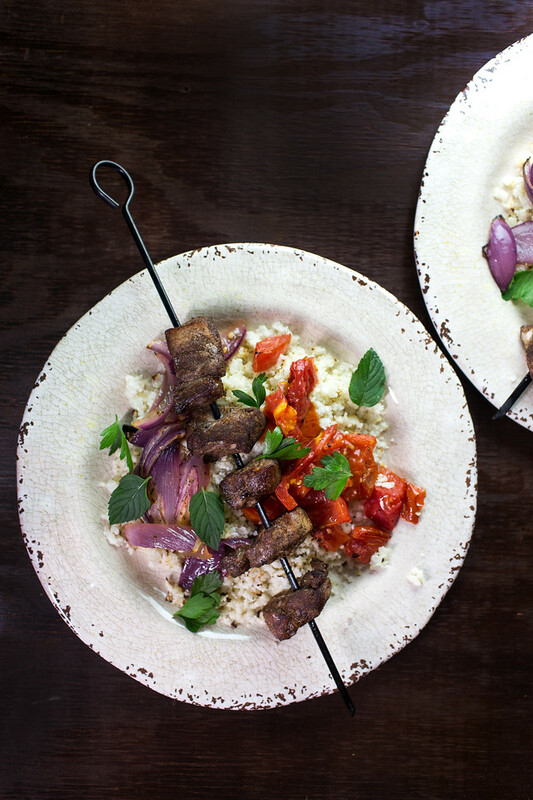 This looks like a delicious meal with the Pork Kebabs and the flavorful Cauliflower Rice. Your recipe looks awesome and thanks so much for sharing it with us at Full Plate Thursday. Have a great day and come back to see us real soon! I’ve been wanting to try cauliflower rice, Pam, so I was really interested to read this post. Love how you have roasted it. Your Pork Kebabs look delicious too! Thank you for sharing with us at the Hearth and Soul Hop. Scheduled a pin. Hope to ‘see’ you again this week! Your photos are stunning. I’d love to try your recipe. Thanks so much for sharing with us at Funtastic Friday. The roasted cauliflower rice is really tasty and clever. A lovely meal!